Feeling the beat at a club or a party is even easier when you’ve got an accessory that turns sounds into flashing lights. The Kisai OTO Equalizer watch from TokyoFlash Japan is a slick watch that can not only tell time, but also acts as a graphic equalizer. The colored display reacts to music as well as ambient sound to produce a one-of-a-kind light show constantly. 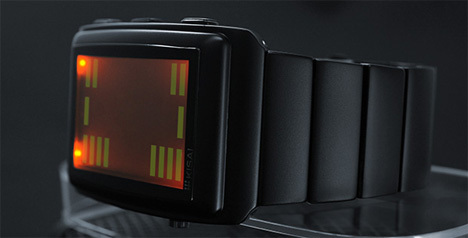 The watch body and strap come in black, but the LCD display comes in blue, red, amber or green. The time is displayed horizontally with hours and minutes displayed in the first two columns and two rows. The seconds take up the third column and are read vertically. When in equalizer only or equalizer + time modes (there is also a time-only mode), the watch picks up on ambient sounds and displays moving bars of light. The sound sensitivity can easily be controlled to make the watch more or less sensitive. The design is rechargeable, offering a month of battery life with minimal use or about seven hours with the equalizer turned on full-time. 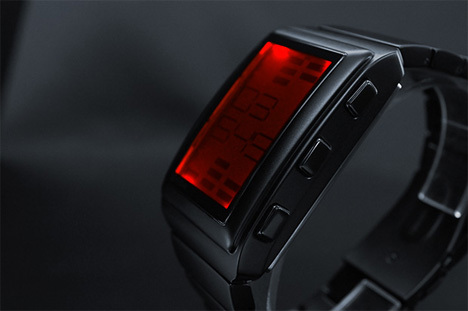 The Kisai OTO watch began life as a fan suggestion in the TokyoFlash forums. German designer Sam Jerichow submitted the design in 2010 and was lucky enough to see it brought to reality. He was inspired by reruns of Knight Rider and the moving lights on the front of K.I.T.T. See more in Clocks & Watches or under Gadgets. February, 2013.